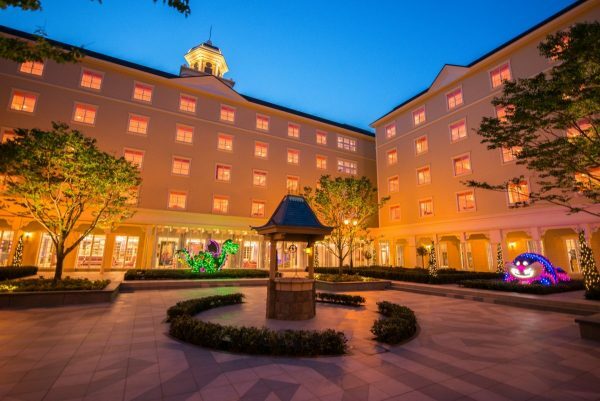 The three official Disney hotels at Tokyo Disney (Disney Ambassador, Tokyo DisneySea Miracosta, and Tokyo Disneyland) have proven to be so popular that a fourth hotel is now in the making to accomodate the high number of guests. 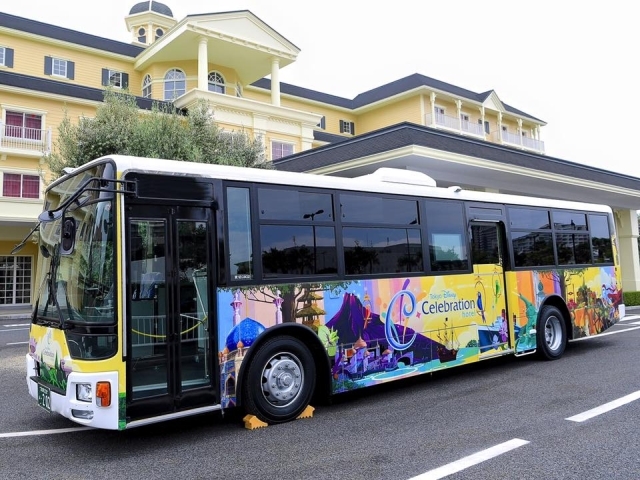 The free shuttle bus which goes to both Tokyo Disney parks. The body bears designs of landmarks and attractions from both parks. 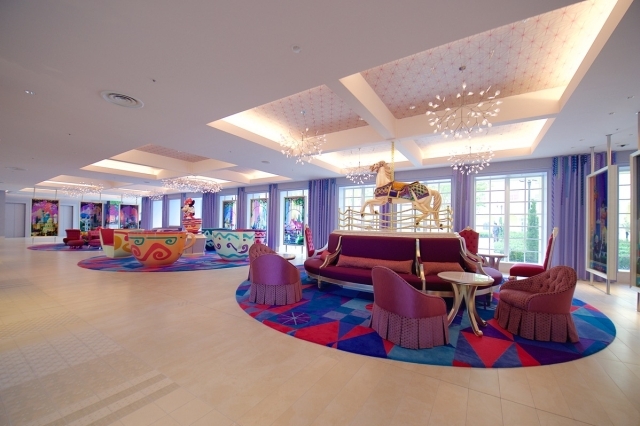 The overall design of Tokyo Disney Celebration Hotel is a combination of themes and attractions from both parks in order to create an atmosphere of adventure. Two buildings will be established for the hotel: the Discover building and the Wish building. The hotel signboard and logo. A front view of the building’s layout. 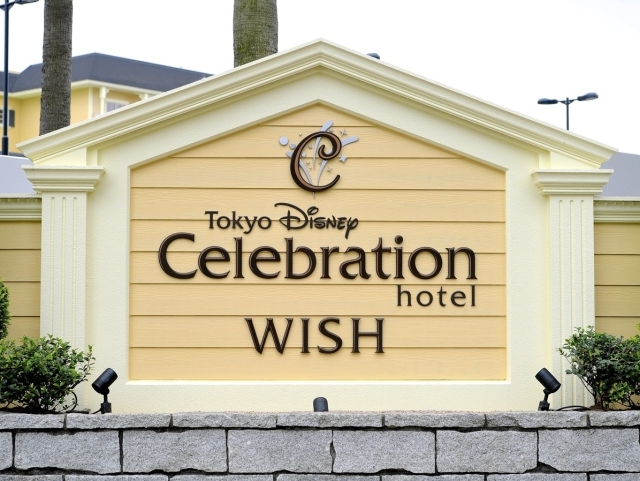 The Celebration Hotel is set to have two openings – the Wish building is scheduled to open early summer on June 1, 2016. 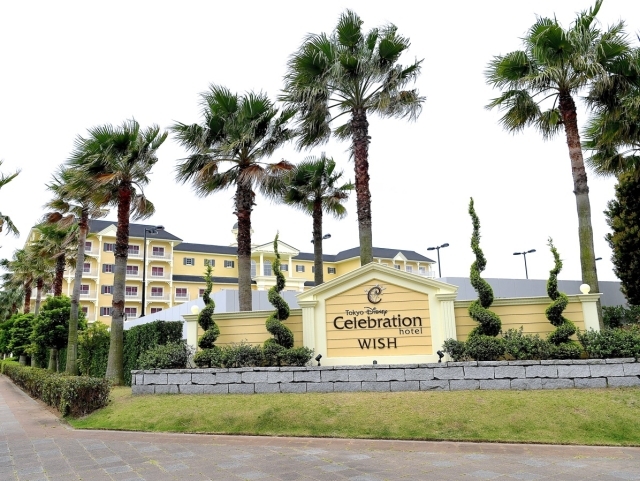 The Wish building will carry themes of dreams and fantasy. 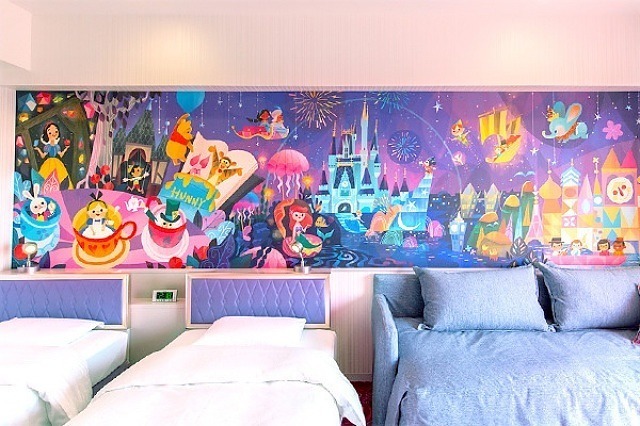 Set to fully open in September 10 of this year, the newest addition to the hotel family promises to “immerse guests in the spirit and excitement of adventure of the Tokyo Disney Resort theme parks”. The carousel horse can be found in the carousel attraction in both parks. 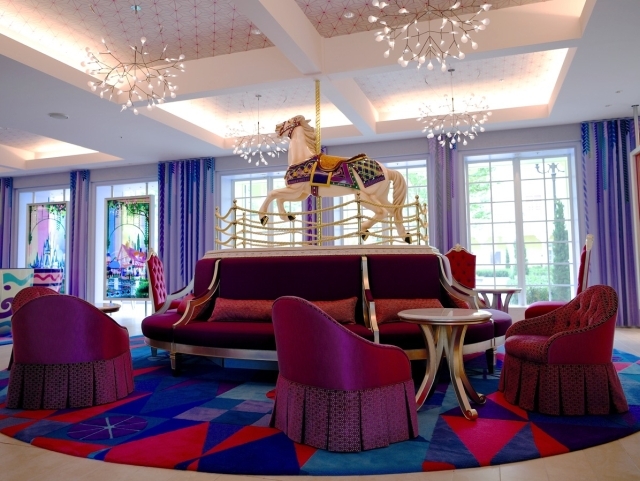 The sofas resemble the same ones on the carousel. 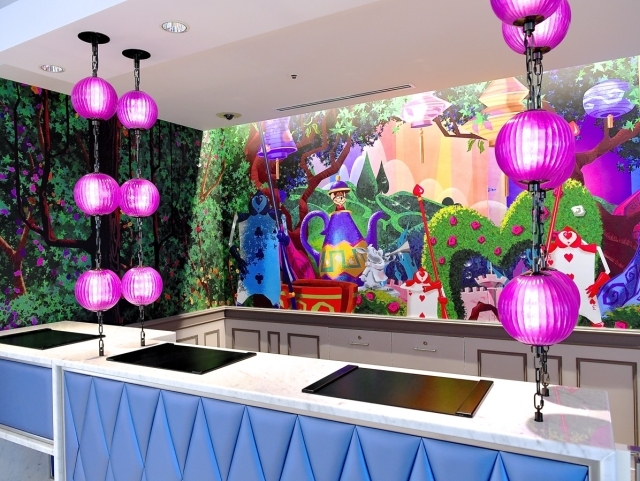 The other half of the seating area features Minnie Mouse with seats fashioned after the Mad Tea Party attraction. 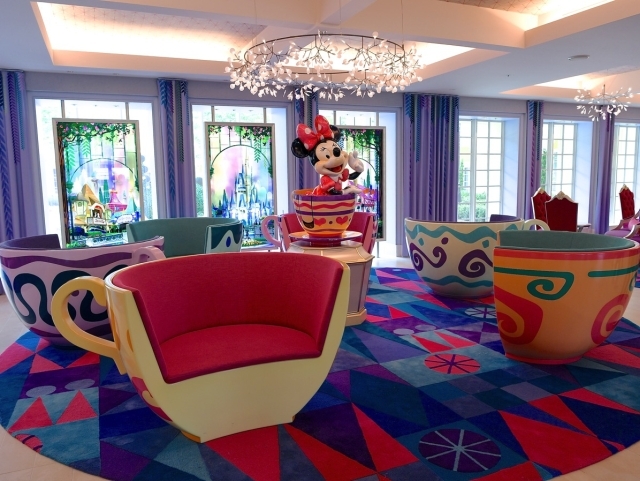 Yet another seating area fashioned after the plush seats of Jasmine’s Flying Carpets in DisneySea (Japan’s version of The Magic Carpets of Aladdin in Magic Kingdom). 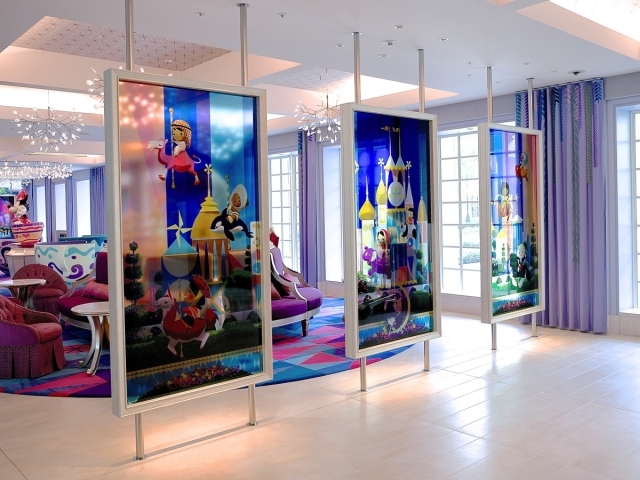 A shot of some of the stained glass art decorating the lobby. This particular art piece features the It’s A Small World attraction. 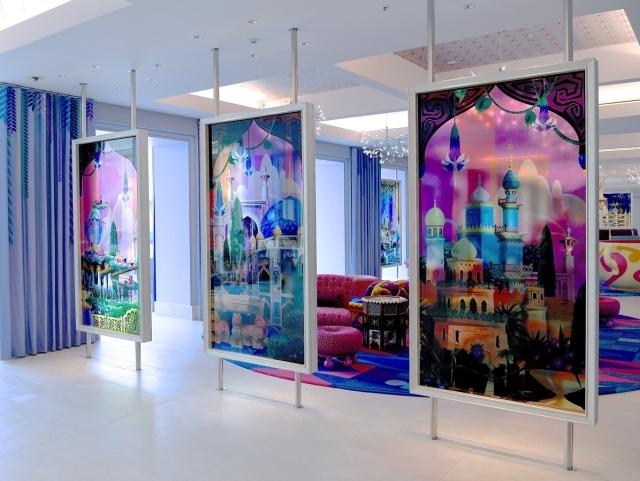 Stained glass artwork of DisneySea’s Arabian Coast. 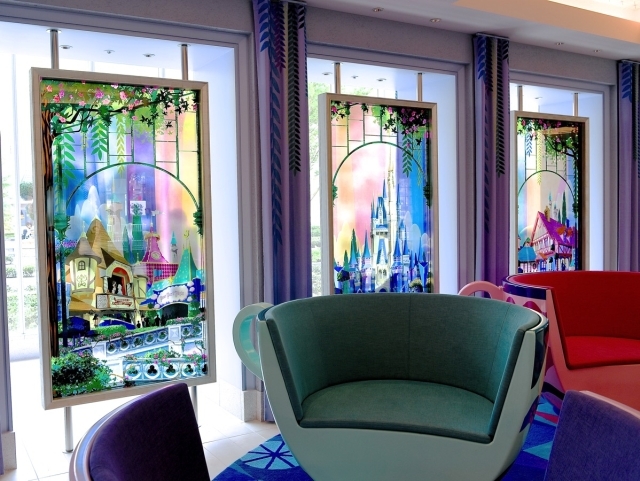 Stained glass artwork depicting Fantasyland. 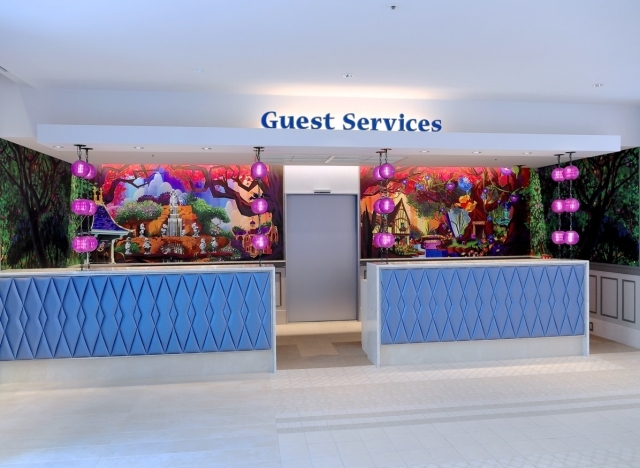 Layout of Guest Services, a large painted mural stretches across the area. 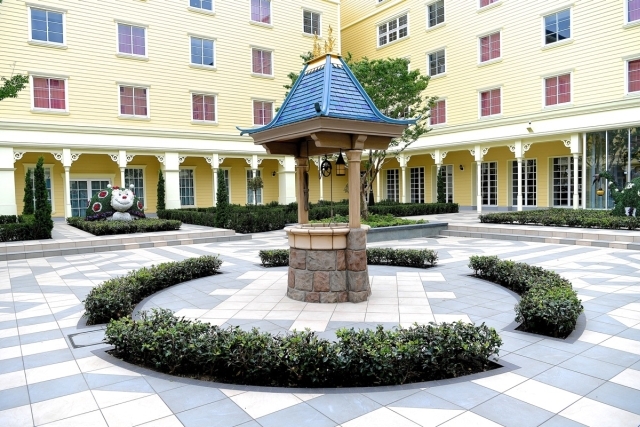 A closer look of the left side which shows the fountain and wishing well of Snow White and the Seven Dwarves. The other half of the mural has some buildings found in Fantasyland and a large portion dedicated to one of the most popular attractions, Pooh’s Hunny Hunt. 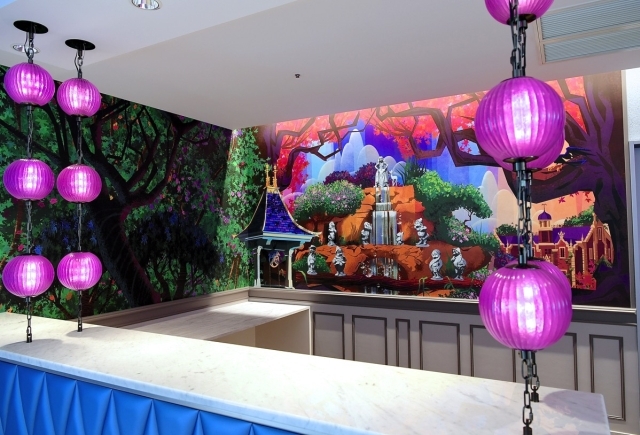 Art mural of the reception desk features Alice in Wonderland on the first half. The latter half is a portrayal of Mermaid Lagoon. One of the many hallways in the hotel. 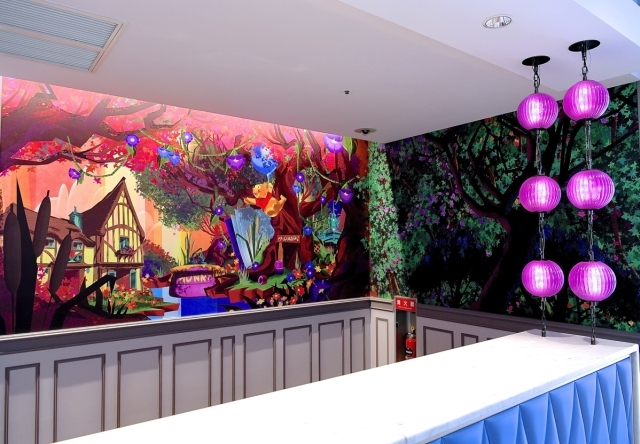 This one takes after Alice in Wonderland with carpeted morning glories and bread n’ butterfly decals on the doors. A sneak peek into one of the guest rooms meant for a family of 4. This simple yet comfortable design is the overall concept of Celebration Hotel. A close-up of the mural shows several recognizable characters and attractions from both parks simplistic in design and colours. 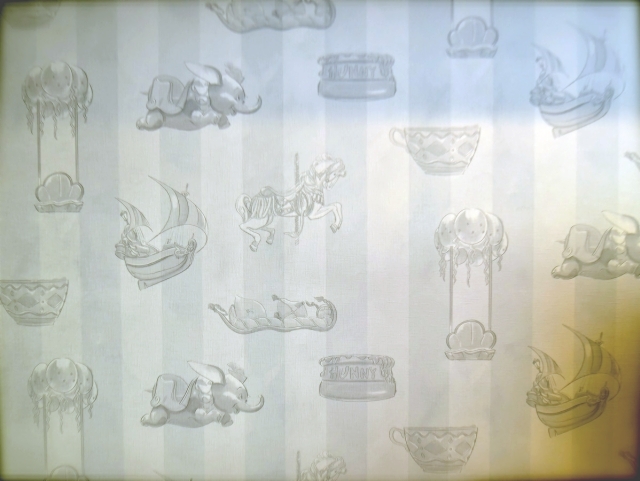 Even the wallpaper bears designs of park attractions. 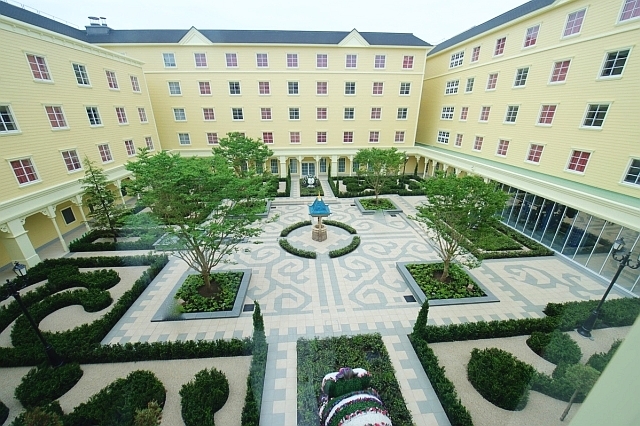 A very large central courtyard can be seen right in the middle of the grand hotel. The centerpiece is Snow White’s wishing well which also makes for a great photo spot. 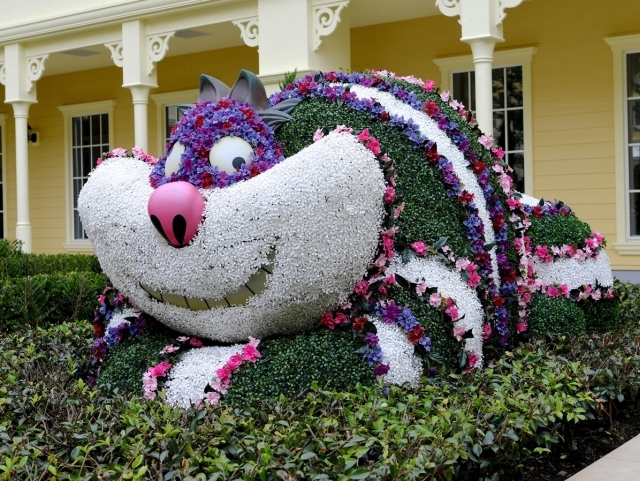 Surrounding the well are large living sculptures of Disney characters such as the Cheshire Cat. 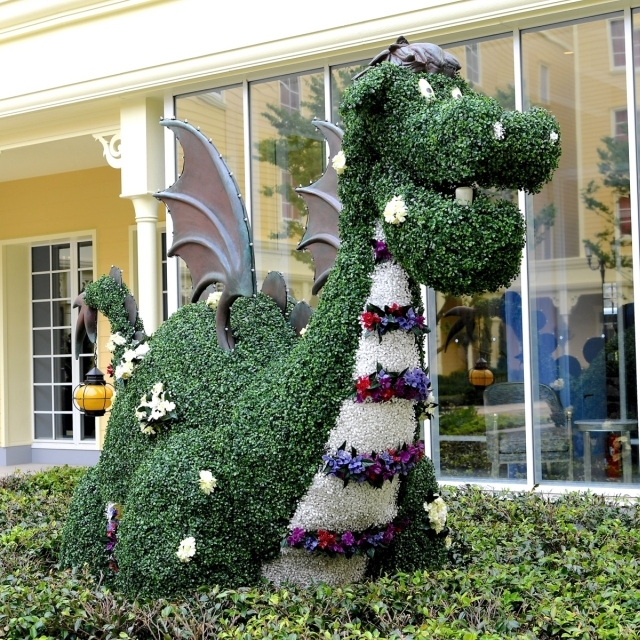 Plant arrangement of Elliot from Pete’s Dragon. 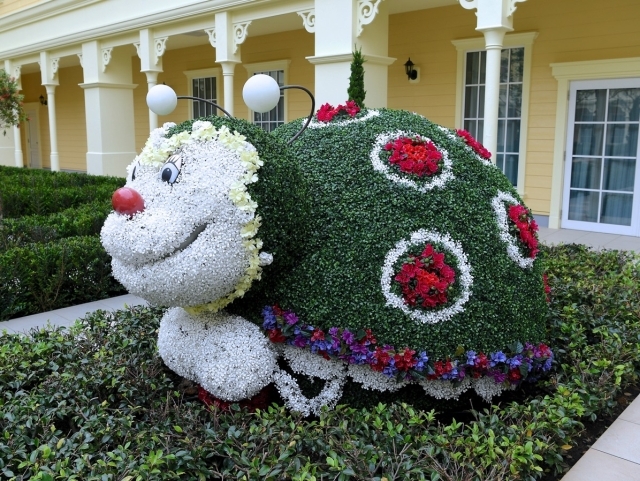 A sculpture of one of the bug floats from the Electrical Parade. The sculptures light up at night to give an air of mystique similar to that of the Electrical Parade. 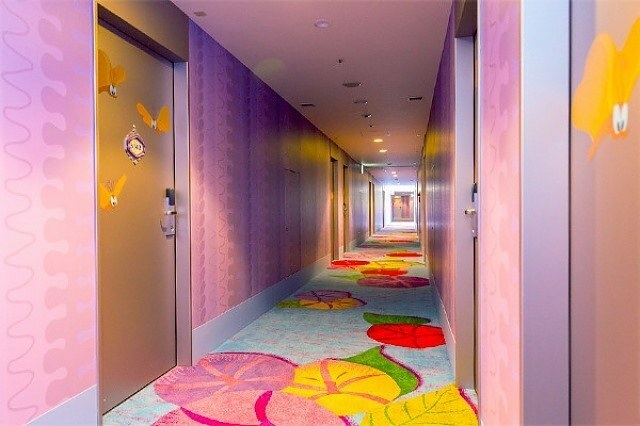 The hotel’s interior designs are certainly much simpler compared to the other hotels, but it boasts “comfortable accommodations and an engaging atmosphere”. 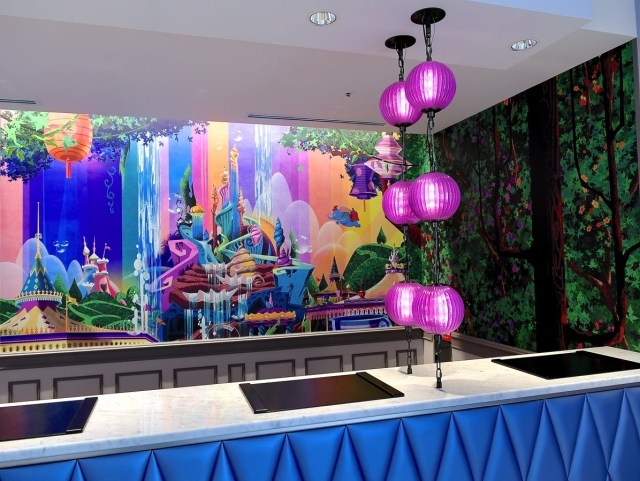 The hotel will also have a Disney shop, a sundries shop, and a breakfast cafe. 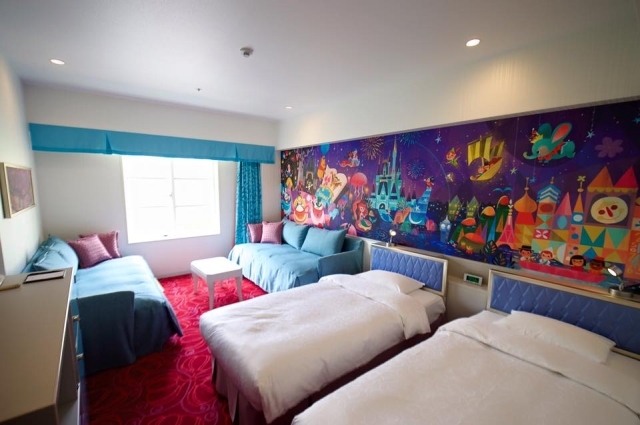 Room rates start from 23,000 yen per night (about $230 USD) for a 4 person adult room. 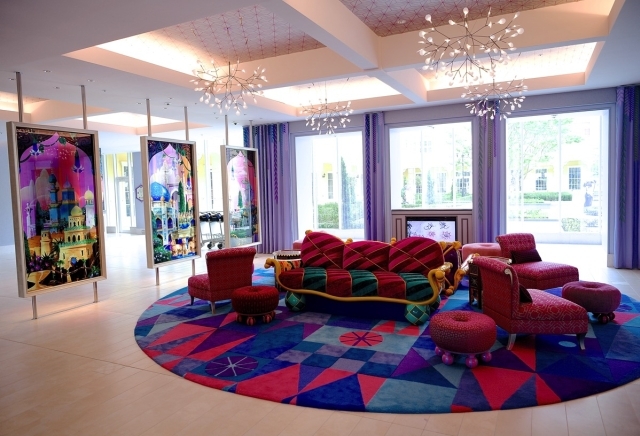 It seems the new Disney Hotel is catering to guests looking for a motel-like experience.